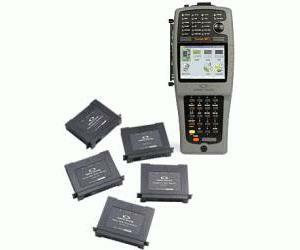 The Optical Test Toolkit module set is the first in its class to provide a loss test set (LTS) in a palm-sized module. Use the built-in OPM to measure the launch and receive powers of your optical transmitters. The LTS provides end-to-end insertion loss and optical return loss measurements. The LTS is compatible with the STT ® FAM LTS, and is used as the portable field tester. The Optical Test Toolkit Module combines all of the tests needed to qualify optical fiber networks and identify faults including a bi-directional loss test, optical return loss, and visual fault locator. It provides stable laser sources and an accurate power meter for physical layer testing and qualifying the power attenuation in the fiber link or optical components. The Optical Return Loss (ORL) test ensures the signal’s transmission qualify by checking for reflections from connectors or discontinuous interfaces. The Visual Fault Locator (VFL) offers the simplest way to check for breaks in the fiber path.